Stepping out of your plus-energy house regulating the light and the temperature cleverly and automatically according to the sun’s path. Catch the vital energies of the nature by training ourselves Tai Chi Chuan or Qi Gong under a snow of cherry tree petals. Cultivate together with our neighbors the community vegetable garden. Harvest the organic vegetables for the family dinner. Wander between the marshes of rainwater harvesting and the recycling lagoons where the sky of koï carps is covered of lotus flowers. Swim in a naturally filtered swimming-pool. Admire the elegant and nagging axial wind turbines. Listen the laughter of children of the eco-district who share with their grandparents the games of Mahjong, Go and Cuju in the wild field. Recycle our organic waste in compost wells producing natural fertilizer. Sort out the other waste via a silent and underground pneumatic collection system. Go to work by electric bicycle or driverless car (Electric Networked-Vehicle), both recharged directly by the photovoltaic roof of the house. Follow the road whose sensory LED lights match according to sounds and movements of the city-dwellers. 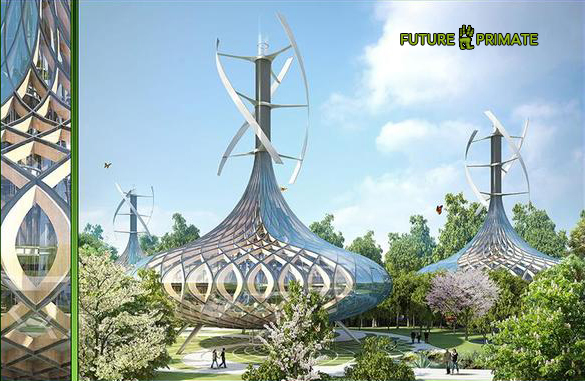 This is the Eco-High-Tech atmosphere of the “Flavours Orchard” project. It’s a pioneer project that fights for the conception of eco-responsible lifestyles along the Daguan river connecting the “Emerald”, the green lake of the city centre of Kunning, to the magnificent Dianchi Lake in the South. Capital of the Yunnan province, the city is located at 1894 meters high and benefits from a temperate climate all the year that gives to it the charming name of « The City of Eternal Spring ». The site of several hectares is an old industrial wasteland devoted to be restored in a new eco-district whose exemplarity in terms of sustainable innovations is supposed to be reproducible everywhere in China. The leitmotiv is to produce more energy and biodiversity than we consume by recycling at the same time our waste in reusable natural resources endlessly towards a post-nuclear, post-fossil and zero carbon emission city. Through the creation of such projects, China is recovering its delay on the ecological debt reimbursement and tries to slow down the massive rural exodus it suffers by the creation of new urban prototypes mixing all the advantages of the city and the countryside. The building sector is a primary energy consumer particularly in China (40% of total consumed energy) in front of the transports (30%) and the industry (30%). It is responsible for more than 40% of total emissions of CO2. It’s obvious that the energy savings are thus the major economic and ecological challenge for this sector. Whereas the prices of the fuel and the non-renewable energy increase unavoidably, the objective is to divide by 10 the consumption of this construction sector for an equivalent service within the next ten years. In this perspective, the concept of this new « Flavours Orchard » eco-district is to build 45 Plus-Energy Villas in a huge community orchard/food garden integrating a Smart Grid self-managed by the gardener-inhabitants and the participants of the project. In the heart of this nourishing landscape, the goal is to associate a state-of-the-art for smart building automation systems and information integrated in each villa (leading to cost reduction and Increased functionality) with an intelligent energy network in order to redistribute the produced excess (electric, calorific, food) towards the nearest needs so as to prevent from the loss in lines or related to the storage systems. In addition to the fuel cells, the electric vehicles are also used as buffer storage of electricity excess produced by the solar roofs assuring thus the daily travels of the inhabitants for free. The objective is also to repatriate the production of the organic agriculture in the heart of the city, center of its consumption. This bio-geographical integration of the master plan respects the natural qualities of the site and maintains the continuity of the endemic ecosystems (trees, hedges, streams, floras and fauna are preserved). Flavours Orchard is a genuine garden sharing its energies designed and cultivated collectively. Ideas are here more shared than the ground, the sun or the wind because it deals not only with producing what to eat, lighten and air conditions but also to meet on a common ground of ecological experimentations and collective projects. It’s an urban landscape open to everybody without fence between the villas, in favor of the neighborhood relationships and the intercultural and intergenerational social links. It’s an educational tool about the environment respect thanks to its ecological master plan, its organic agriculture technics, its smart home automation strategies and its integration of renewable energies. The private garages for electric cars and the technical rooms for home automation are located underground. This basement distributes each villa under the central path to liberate completely the orchard dedicated only to pedestrians, cyclists or electric driverless cars. The future families of these Plus-Energy villas will be able to live and work comfortably in their villa reinventing new eco-responsible lifestyles maximizing the normal living standards. The 45 Plus-Energy Villas produce more energy from renewable energy sources, over the course of a year, than they consume from external sources. This is achieved by using large North and South facing window areas to allow sunlight to penetrate the structure, by reducing the need for energy use from air cooling units and light bulbs with triple-glazed windows, and by the addition of heavy insulation that means the structure is already warm in the evening and therefore needs less heating. These passive buildings (BEPAS) that capture heat during the day in order to reduce the need to generate heat over night, exceed their energy needs through renewable energy production by the integration of solar photovoltaic and solar thermal panels, geothermal heat exchangers, and combined heat and power units (CHP). All grey water is recycled in lagoons for agricultural irrigation and toilet flushing. All waste water will be sent to bio-reactor facades (with panels filled with algae) for anaerobic digestion and the methane emitted during the digestion process will be used to produce energy and to cool the interiors. The construction of positive energy constitutes a high technological and conceptual rupture. These villas are thermally insulated without discontinuity and without thermal bridges. They are airtight, present controlled ventilation and are also equipped with economical domestic appliances of A+++ class. They generalize the LED lighting with automatic detection of presence and needs. They have a total consumption of primary energy (heating, sanitary hot water, lighting, all appliances) estimated at less than 50 kWh/m2/year for an average production that can reach 100 kWh/m2/year via the sun or wind. According to the usage of inhabitants, the consumption of primary energy could even decrease under 35 kWh/m2/year.